In a medium saucepan, heat milk over medium-low heat. Add chocolate chunks and stir occasionally until it has dissolved, a few minutes. Remove from heat and using a molinillo or whisk, emulsify or foam as much as you can. Set aside. In a mixing bowl, combine the flour with the sugar, baking powder, baking soda and salt. Add the melted butter to the dry ingredients as well as the beaten egg and start to mix with a spatula. Slowly, pour the Mexican chocolate milk, mixing fast so the egg will not cook (!) if the milk is still hot. Continue to combine until you get an even and homogeneous batter, just a minute or so. You should have a shiny and a bit runny batter. Taste it: it’s so good! Let it sit for a few minutes, it will fluff up a bit, which is what you want. Meanwhile, heat your special pan or skillet over low to medium-low heat until very hot, about 4 or 5 minutes. Butter the pan and spoon batter into each hole, about 3/4 of the way up each cup. Once you can move the balloons around (like when pancakes are ready to flip), but the batter in the center can still be runny, you can add a half a teaspoon of a filling of your choice. Cover with a bit more batter to fill the cups just a tad beyond the rim. Using two spoons or two wooden skewers, flip the donuts to the other side. Give them a minute or two and remove from the pan. Dust with confectioners' sugar, if desired, (I always do!) and eat while hot. If making normal pancakes, cook as regular pancakes. Heat the skillet over medium-low heat until very hot. Grease with unsalted butter and ladle batter into the pan. Flip once the top shows bubbles and the bottom is cooked enough to be released from the pan. Cook on the other side for a minute or two and serve. Add the fillings as toppings instead of as a filling. I just watched your show featuring Mexican chocolate donuts and that pan is fascinating, I must get one. In your recipe, you mention Mexican chocolate. Is the total weight of each chocolate bar 3 ounces? Or, do we cut the chocolate into 3 ounce pieces? If so, what is the total weight of each candy bar ? Please advise. Gracias! It is 2 Mexican chocolate bars that are 3 ounces each. I hope you have fun cooking and eating the donuts, Susan! Patti I have to let U know that your program is one of my favorite in create show.Your finished cooked product look so good ! !.God bless U always ,and blessings to u beautiful fam..I’m from Dover,fl.where I learned to eat and cook Mexican food and I love it. This recipe sounds great, however the last paragraph of the recipe talks about pancakes. Doesn’t seem to fit the origional recipe. Type-o. Or Sam I missing something. Pati I enjoy so much you show. I love Mexican conchas bread and mantecaditos.Please,if is possible gave the recipes.Thanks.Dios te bendiga. 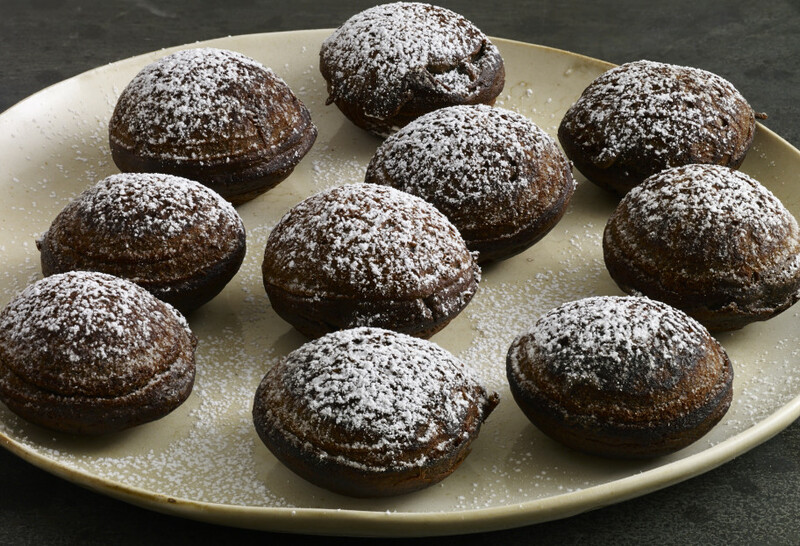 First time watching your show and my half-Mexican, half-Scandinavian (All-American) son and I felt it was fate that you and your son were making Mexican Chocolate Donuts in an Appleskiver pan – exactly something the two of us do! It felt like a magical and fateful moment for us! Thank you for that special moment. Wow! What a wonderful coincidence!! Thank you for watching! Is there any way to use a muffin tin to make the doughnuts? Surely you can give it a try, but keep a good eye on them as it is very similar to pancake batter and may dry out fast… It will bake quickly. This uses a different pan on top of stove,easy to make & recipe is a delightfull surprise.Thank You,Miss.Pati! the recipe says 1 large egg. These look so yummy and I have the correct pan! Directions call for eggs, but ingred. list doesn’t tell you how many eggs. Help!!!! The recipe calls for 1 Large Egg.